Electric cars are parked at the Los Angeles Police Department in 2016. Electric cars have been on the market for some time now but surveys show that even in California adoption has been slow. A new initiative called Veloz, however, hopes to change that with a multimillion dollar public awareness campaign announced Wednesday. Auto giants are teaming up with California officials and local power utilities to launch the nonprofit, whose mission is to accelerate the mass adoption of electric vehicles in the state. Currently California has about 350,000 electric vehicles on its roads, according to the Alliance of Automobile Manufacturers. While the rate of electric vehicle adoption significantly outpaces other states, California still has far to go to reach Gov. 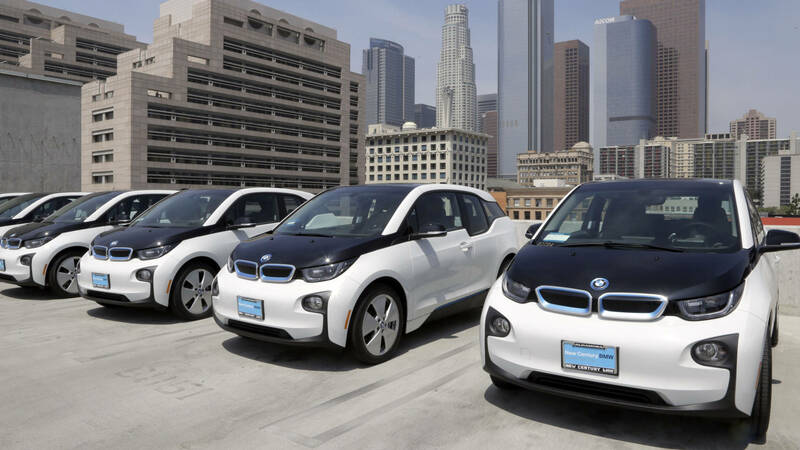 Brown's mandated goal of 5 million zero-emission vehicles on the road by 2030. The Veloz membership includes 35-plus organizations, all with a stake in the transportation sector, including General Motors, Southern California Edison and the California Air Resources Board. "We're seeing the effects of climate change in California here today," Ron Nichols, president of Southern California Edison, said during Wednesday's press call. "We've seen droughts and wildfires intensifying, and that's one of the many reasons that electrifying transport, we believe, is imperative to addressing the reduction in greenhouse gas emissions." Veloz' mission is to "create a movement," says Executive Director Josh Boone. The biggest impediment to electrifying transportation has been the lag between public perception and the pace of developments, according to Mary Nichols, head of the California Air Resources Board. "Clearly the lack of awareness is a critical hurdle that we have had to overcome early on, despite . . . costs coming down, number of models increasing, number of charging stations out there," she said on Wednesday. "We have to show the public that these things are available." Nichols described the campaign as the "largest multistake holder, multimillion-dollar campaign" for electric vehicles in North America. The group has a nearly $4 million budget, with half that amount coming from Electrify America, a public awareness initiative launched by Volkswagen as part of a legal settlement related to cheating on emissions tests for its diesel vehicles. The group's first set of ads, dubbed "opposites attract," will feature a cheeky take from "unusual spokespeople" promoting electric cars, according to Boone. The new initiative follows a similar campaign launched in May in multiple states on the east coast dubbed "Drive Change. Drive Electric." Veloz plans on raising additional funds for future campaigns.